• The “Start Game” window has an extra button added: Resume from last Autosave. This makes it even easier (and more immediate) to continue a game session after a crash, freeze or other problem. • Autosave now allows going farther “back in time”: When an autosave is performed, the existing autosave file is renamed to autoscen_20, the existing (if any) autoscen_20 file is renamed to autoscen_40 etc. all the way to autoscen_100. This way, whenever there is a reported problem the dev team can go back up to 100 (RL) seconds to troubleshoot reported issues. This solves the “autosave after the fact” problem. * A brand-new series of tutorial videos by Baloogan. * Campaign playing & campaign editing! v1.09 includes the “Northern Inferno” campaign, a “WW3 in the North Atlantic in 1975” storyline created by Paul A. Bridge. From the start menu, click on “New Campaigns”. The “Campaigns” window will come up, listing all available campaign. Clicking on any campaign lists the general description for it. You can then click on “Start new campaign” to commence a new campaign session, or click on the tab “Resume from save” where you will see the available saves grouped by the campaign to which they belong. (An infinite number of saves per campaign are possible). After the intro video plays (you can skip videos by pressing any key during playback) you are presented with the first scenario. Once you reach the specified pass-score for the scenario (visible on the “Scoring” window), you can either proceed to the next scenario or press on to achieve a better score. If instead you want to resume from a campaign save, simply select the desired save and click “Resume from selected save”. The campaign scenarios are also available for play as “standalone” scenarios, like all other existing Command scenarios. Simply navigate to the “\Scenarios\Northern Inferno” path from within the “Load Scenario” window. NOTE: You can play the NI scenarios only if you have purchased NI, either as a standalone expansion (no previous ownership of CMANO) or as an addition to your current CMANO installation. If you attempt to load a NI scenario without having a license for it, a relevant window will pop up and prompt you to purchase the license. * You can add both scenarios and attachments (typically videos), and re-arrange their order with the “Move up” / “Move Down” buttons. * You can edit the title & description of the campaign, as well as its “ending” page. * You can set the pass-score for each scenario. Once the player reaches this score he can then proceed to the next scenario. * You can save the campaign. IMPORTANT: All campaign-related files, including attachments, should reside in a single folder. Throughout the code the campaign logic first of all searches for the campaign file (by ID) and uses it as a “reference” for the location of all other related files. (If you check you will notice that while playing a campaign scenario only the “Save” command is available, and not the “Save As”. This is deliberate so that the player doesn’t save outside the campaign folder). * FIXED: Out-of-memory error causes “red X of doom” on main map. * When browsing saved games, the data & time of each save is listed. This helps the player pick the most recent save or a particular save of interest. 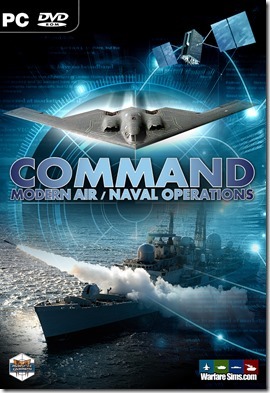 * Includes 3 new tutorial scenarios by Mark Gellis (from the “Uncle Mark’s Tutorials” series), and a dedicated air-to-air refueling tutorial by Tomcat84. * Miscellaneous tweaks to reduce RAM usage, and significant performance improvements. * Massive improvements to simulation speed and RAM consumption. * If autosave fails while running a very large scenario (due to memory exhaustion), the player is notified by a balloon popup instead of crashing the game. * Significant performance improvements on both sim-core and map engine. All new major features are optional (enabled per-scenario, just like the pre-existing features “Detailed gunfire control” and “Unlimited base munitions”), and available for use only when the Chains Of War license is present. Attempting to load a scenario with any of the new features without having the corresponding license results in a block, with a window shown that informs the player of the unlicensed features and how they can be unlocked/enabled. * Most of the features specific to Chains Of War (comms disruption, cargo operations and detailed aircraft damage) are now also unlocked by the “Shifting Sands” DLC. An aircraft can be instructed to either fire off a single chaff bundle (Attack Options –> Lay Chaff (Single Burst)) or lay a continous stream in order to form a corridor (Lay Chaff (Continous Stream)). If the latter is selected, the aircraft will keep firing chaff bundles until its supply is exhausted or the command is checked off on the menu. This is a typical chaff cloud a bit after deployment: http://i.imgur.com/EWZbPNk.png . It steadily grows after dispersion to max dimensions of 6000x1500m per bundle. The “31-35Kft” figure indicates the upper and lower vertical limits of the cloud (it slowly descends towards the ground like a curtain, and eventually dissolves). An aircraft that is covered by the chaff cloud enjoys a very significant reduction in detection range against radars (its effective RCS is severely reduced against the chaff background). When used en-masse, this allows creating a corridor through which a strike force can traverse undetected. – Chaff corridors are precisely that: Corridors. They do not form “opaque vertical walls” beyond which the protected aircraft may roam freely; the entire HVA group must carefully walk through the corridor or risk detection once they step out of it. Naturally this straightjacketing limits the tactical flexibility of the protected force. – An aircraft is covered by a chaff cloud regardless of relative altitude if the radar is 2D-capable (there is a single beam, and it is always blocked by the chaff cloud). Against 3D-capable radars, which alter the beam elevation (or use multiple stacked beams), the aircraft has to actually be within the vertical limits of the cloud in order to be covered by it. (Hence the map symbology). – Chaff is most effective against low-frequency radars (because of the large radar resolution cell). As frequency goes up, the effectiveness of chaff decreases sharply. – Chaff is most effective against older radar sets (Late 1960s tech and before). As signal processing improves, this technique becomes increasingly obsolete (AESAs in particular ignore chaff altogether). An example of a dedicated chaff-laying aircraft is the Tu-16P Badger-H (#3030 in the CWDB) which has the suitable large-capacity chaff dinspenser; Some tactical aircraft such as the F-4 have dedicated chaff-laying loadouts (dispensers and chaff-bombs). * New feature: Sprint & drift for single units (ships, subs and land mobiles). This is toggled in the throttle/alt window (F2). When enabled, the throttle presets are disabled, and the horizontal throttle trackbar, instead of being used to directly change the desired speed, is instead used to specify the desired _average_ transit speed. The “crew AI” then takes care of sprinting & drifting as necessary to maintain this average speed.